Many people over the years have studied the Bible from a medical point of view offering diagnoses for the symptoms and signs that appear to have afflicted numerous individuals in the Bible. We review the biblical characters in the Old Testament and offer newer insights to their neurological diseases. We first look at the battle between Goliath and David. Interestingly, Goliath probably suffered from acromegaly. We propose autism as a diagnosis for Samson which would precede the first known case of autism by centuries. Isaac was a diabetic, and he probably had autonomic neuropathy. Few verses from the books of I Samuel, Psalms, and Ezekiel reveal symptoms suggestive of stroke. Jacob suffered from sciatica, and the child of the Shunnamite woman in II Kings had a subarachnoid hemorrhage. These instances among others found in the Old Testament of the Bible offer newer insights on the history of current neurological diseases. Background: Comprehensive instruments to evaluate the child rearing knowledge and practice are not readily available for clinical research. Materials and Methods: We have designed in two phases a new instrument to evaluate the child rearing knowledge and practice under the four major domains of child rearing. Twenty-five subject experts from the field of Paediatrics, Obstetrics, Neurology and Nursing elicited the content validity of the instrument. The test retest reliability was evaluated by 25 young mothers who completed the CRKS at an interval of two weeks. Results: The Content Validity Ratio (CVR) of individual items ranged between 0.6 to 1. The reliability was tested for the 20 individual items of the CRKS using Kappa coefficient. The measurement of agreement Kappa ranged from 0.51 to 1. The total knowledge scores and sub scores data were analysed for correlation using Pearson's correlation coefficient. A significant Pearson's correlation indicated that the total scores were consistent over time (r = 0.89). The sub scores on feeding (6 items), Growth and development (4 items), protection (7 items), and infant stimulation (3 items) were found to have reliability of 0.91, 0.76, 0.84, and 0.89 respectively using Pearson's correlation. Conclusion: The instrument is found to be valid and reliable and can be used to measure child rearing knowledge and practice in early infancy. Objectives: Hypertension is known to be associated with cognitive decline. Many studies revealed that control of hypertension with antihypertensive therapy controls the cognitive decline associated with hypertension. While there are reports that suggest that antihypertensive drugs do not provide protection from cognitive decline, the present study is designed to evaluate the cognitive status of patients recently diagnosed as hypertensive and effect of 3 month long antihypertensive therapy on cognitive functions. Materials and Methods: A predesigned pretested questionnaire was used to collect the information. The PGI memory scale (PGIMS) was employed to assess memory function of patients. Baseline memory functions were evaluated before starting the treatment with antihypertensive and compared with the cognitive function scores of healthy volunteers. After the 3 months of treatment, cognitive functions were evaluated again by the same scale. The unpaired t-test was used to compare the cognitive functions between case and control and the paired t-test was used to compare pre- and post-treatment score. Results: This study revealed that mean scores of six subtests of cognitive functions were less in cases as compared to subjects in comparison group. After 3 months of antihypertensive therapy, scores of five sub-tests were found to be increased. Among these five subtests, four were those which were found declined at the baseline. Conclusion: This suggests that antihypertensive therapy given for 3 months improved the score of those cognitive function tests in which hypertensive patients perform poorly during recruitment and there was no deterioration of any test after 3 months of antihypertensive therapy. Introduction: Treatment of spontaneous supratentorial intracerebral hemorrhage (SICH) is still controversial. We therefore analyzed the comatose patients diagnosed as having spontaneous SICH and treated by surgery. Materials and Methods: We retrospectively analyzed the collected data of 25 comatose patients with initial Glasgow Coma Scale (GCS) ≤ 8 diagnosed as having spontaneous SICH and they had been treated by surgical evacuation between 1996 and 2008. The outcome was assessed using Glasgow outcome scale (GOS). The side and location of the hematoma and ventricular extension of the hematoma were recorded. The hematoma volume was graded as mild (<30 cc), moderate (30-60 cc) and massive (>60 cc). Results: Age of the patients ranged from 25 to 78 years (mean: 59.6 ± 15.14 years). Among the 25 patients studied, 11 (44%) were females and 14 (56%) were males. GCS before surgery was <5 in 8 (32%) patients and between 5 and 8 in 17 (68%) patients. The hematoma volume was less than 30 cc in 2 patients, between 30 and 60 cc in 9 patients and more than 60 cc in 14 patients. Fourteen of the patients had no ventricular connection and 11 of the hematomas were connected to ventricle. All the 25 patients were treated with craniotomy and evacuation of the hematoma was done within an average of 2 hours on admission to the emergency department. Postoperatively, no rebleeding occurred in our patients. The most important complication was infection in 14 of the patients. The mortality of our surgical series was 56%. GCS before surgery was one of the strongest factors affecting outcome GCS (oGCS) (P = 0.017). Income GCS (iGCS), however, did not affect GOS (P = 0.64). The volume of the hematoma also affected the outcome (P = 0.037). Ventricular extension of the hematoma did affect the oGCS and GOS (P = 0.002), but not the iGCS of the patients (P = 0.139). Conclusion: Our data suggest that being surgically oriented is very important to achieve successful outcomes in a select group of patients with SICH. Aims: To evaluate the results of carotid artery angioplasty and stenting (CAS) in treating extracranial carotid artery stenosis performed by neurologists in our center and compare the results with other large published series. Materials and Methods: Data for all patients who underwent CAS from January 2003 through November 2007, was retrieved from the Nanjing Stroke Registry. Perioperative and post-procedural complications within 30 days following stenting were analyzed and compared with that from other series. A total number of 75 patients were enrolled, with a mean age of 65.9 ± 8.8 years, and 64 (85.3%) of them were male. Results: Procedural success was achieved in 74 patients (98.7%). Pre-treatment stenosis was 73.8 ± 14.9 and post-treatment residual stenosis was less than 10%. Thirty-four patients (45.3%) had bilateral carotid artery disease and seven (9.3%) had tandem stenosis. The neurological complication rate was 3.9% (one major and two minor strokes). Bradycardia in four (5.3%) and hypotension in 13 (17.3%) were observed during procedures. Using the Fischer's exact t test, the complication rate compared with the large published series did not reveal any statistically significant difference (P > 0.05). Conclusions: We conclude that neurologists, with adequate training, can develop and add this technical skill to the existing cognitive skill of vascular neurology and safely perform stenting. Objectives: The precise pathophysiology of primary writing tremor (PWT) and writer's cramp (WC) is not known. The aim of this study is to compare the cerebral activation patterns in patients of PWT, WC and healthy controls, during a task of signing on paper, using functional magnetic resonance imaging (fMRI). Materials and Methods: Six subjects with PWT, three with WC and six healthy volunteers were examined using a 1.5-Tesla scanner. The paradigm consisted of three times repetition of a set of period of rest and activity. Each set consisted of 10 blood oxygen level dependent (BOLD) echo-planar imaging (EPI) acquisitions at rest followed by 10 BOLD EPI acquisitions while signing their names on paper using the dominant right hand. Entire brain was covered. SPM99 analysis was done. Results: In comparison to the healthy controls, the following differences in cerebral activation were noted in the patients: (a) primary and supplementary motor areas showed overactivation in patients of PWT and underactivation in patients of WC, (b) the cingulate motor area showed underactivation in patients of PWT and overactivation in patients of WC and (c) the cerebellar activity was reduced in both WC and PWT. Conclusion: Our preliminary findings suggest that the cerebral and cerebellar activation patterns in PWT and WC during signing on paper are distinct from each other and from healthy controls. There may be cerebellar dysfunction in addition to motor dysfunctions in the pathogenesis of these disorders. Objective: The purpose of this study was to examine the degree of contribution from the vertebrobasilar and carotid systems to the origin of the PCA in fetal autopsy brains of last trimester of pregnancy and to compare with published data on the configuration of adult and fetal brains in a population of Sri Lankan origin. 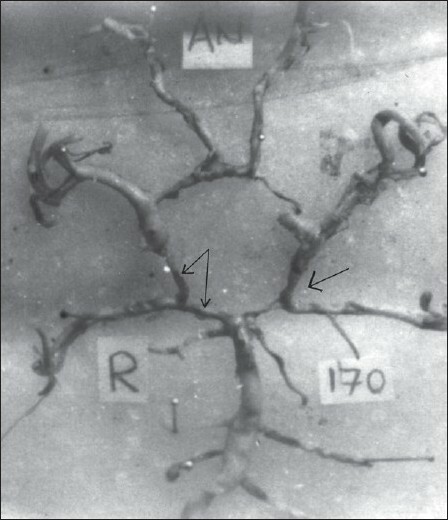 Materials and Methods: The external diameter of the PcomA, pre-communicating part (P1), and the post-communicating part (P2) of posterior cerebral artery (PCA) of 34 fetal brain in the last trimester of pregnancy (30 to 40 weeks of gestation) was measured using a stereomicroscope equipped with a micrometer calibrator. Results : The blood supply to the occipital lobe mainly via the PCA was seen in 25 (59%) of fetal brains as compared to that in the literature 220 (93%) in adults brains and the blood supply to the occipital lobe mainly via the internal carotid artery (ICA) was seen in 16 (34%) of fetal brains as compared to 25 (7%) of adults brains (P < 0.0001), transitional configuration where the PcomA is equal in diameter to P1 segment of the PCA was seen in 5 (7.4%) of fetal brains and 8 (2%) of adults brains. Conclusions: The present study reveals that from the newborn to the adult there is shift from carotid system to the vertebrobasilar system, this justifies further studies on different racial and geographic regions which may give a clearer picture about the cerebral hemodynamics from childhood to adult. Acute decompression syndrome (Caisson's disease) is an acute neurological emergency in divers. It is caused due to release of nitrogen gas bubbles that impinge the blood vessels of the spinal cord and brain and result in severe neurodeficit. There are very few case reports in Indian literature. There are multiple factors in the pathogenesis of Acute decompression syndrome (Caisson's disease) such as health problems in divers (respiratory problems or congenital heart diseases like atrial septal defect, patent ductus arteriosus etc), speed of ascent from the depth and habits like smoking that render divers susceptible for such neurological emergency. Usually, immediate diagnosis of such a condition with MRI is not possible in hospitals in the Coastal border. Even though, MRI is performed, it has very low specificity and sensitivity. Facilities like hyperbaric oxygen treatment are virtually non-existent in these hospitals. Therefore, proper education of the divers and appropriate preventive measures in professional or recreational divers is recommended. We report three children with pseudohypoparathyroidism aged 13-16 years who presented with seizures and tetany. CT scan revealed striatopallidal calcification in two. MRI revealed wide-spread involvement showing T1 hyperintensity in striatopallidodentate distribution in all three and midbrain in one patient. T2 and FLAIR images were normal. T1 hyperintensity could represent early stage of calcification in whom MRI is more sensitive. Sarcoidosis is a systemic disease characterized by noncaseating granulomas in the involved organs. Neurologic manifestations involving the central and/or peripheral nervous system occur in about 5% of patients. Neurosarcoidosis is often refractory to conventional treatment and therefore more effective treatment options are needed. While the etiology of the disease is still unknown, there is now a better understanding of its pathogenesis on a molecular level. It is clear that tumor necrosis factor-α (TNFα) plays a pivotal role in the development of the granulomas and it is believed to be a key cytokine involved in the pathogenesis of the disease. Taking advantage of this better understanding of disease pathogenesis, anti-TNFα agents are being increasingly used to treat refractory sarcoidosis. 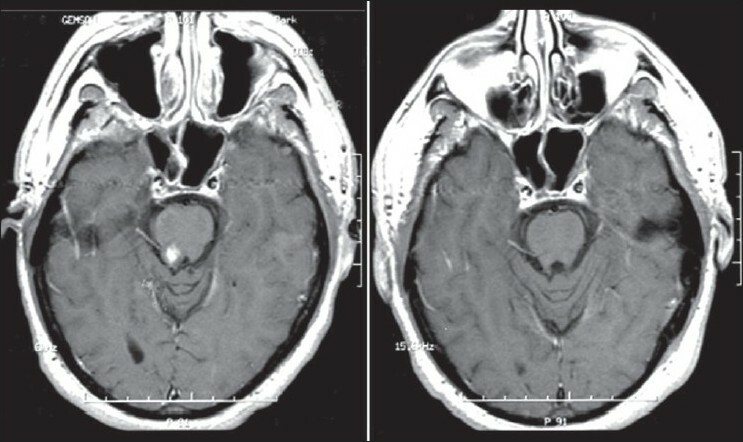 We report a patient with refractory neurosarcoidosis who showed dramatic improvement in the clinical and radiological manifestations following treatment with infliximab; he suffered a relapse upon discontinuation of the medication. Opsoclonus-myoclonus syndrome (OMS) is a rare condition that has been reported from all parts of the world. It is well recognized as a paraneoplastic syndrome in children with neuroblastoma and in adults with small-cell carcinoma of lung and some other cancers. It may also occur in association with various central nervous system infections. We report a case of OMS in a patient with varicella zoster virus infection. IgM antibody for varicella-zoster virus was detected in the serum and the cerebrospinal fluid. The patient improved after treatment with clonazepam and was asymptomatic at 1-month follow-up. A 51-year-old male was admitted in our institute following an episode of near-drowning. He later developed ventriculitis and cerebral ring-enhancing lesions. He died following a subarachnoid hemorrhage due to rupture of a mycotic aneurysm involving the right fetal posterior cerebral artery. Scedosporium apiospermum was isolated from the cerebrospinal fluid. Central nervous system invasion by S apiospermum may present insidiously in near-drowning patients and, therefore, requires a high index of suspicion. 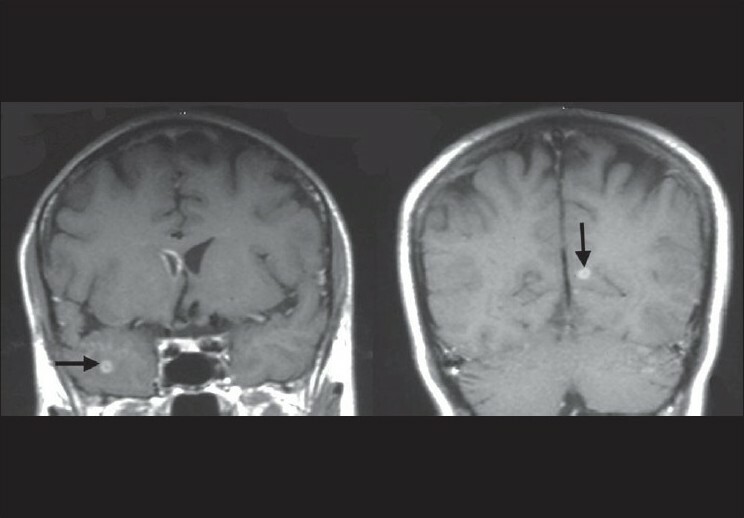 In cases with the characteristic cerebral ring-enhancing lesions and concomitant ventriculitis, treatment should be instituted while awaiting fungal culture. With this article we intend to alert neurologists, intensivists, and physicians to this near fatal infection, as early identification and prompt treatment with voriconazole may be life saving. Cerebral amyloid angiopathy (CAA) is an important cause for intracerebral hemorrhage (ICH), yet often goes undiagnosed in the absence of histological examination of the blood vessels in the clot. 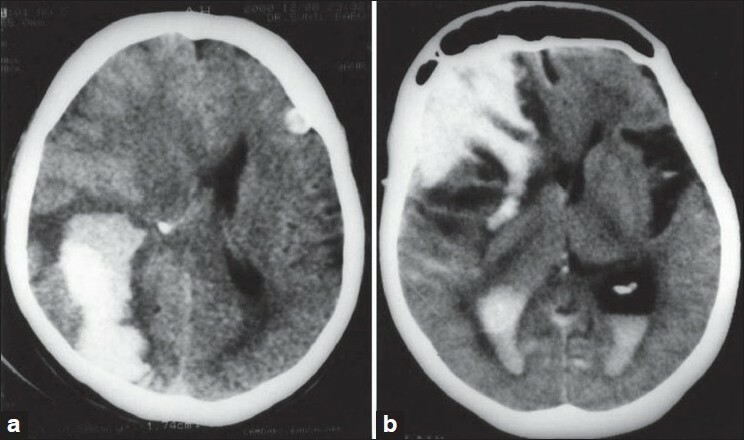 In this study, we report three patients who presented with ICH. Two patients had no risk factors for bleed, whereas one patient had systemic hypertension. Tissue for analysis was obtained during hematoma evacuation in two patients and necropsy in the third. Histopathology in all three patients revealed severe degree of amyloid angiopathy with extensive amyloid deposits in the vessel walls, which was diagnostic of CAA. Both medium- and small-sized leptomeningeal and cortical vessels were affected. The vascular amyloid deposits stained with Congo red and displayed characteristic birefringence under polarizing light. 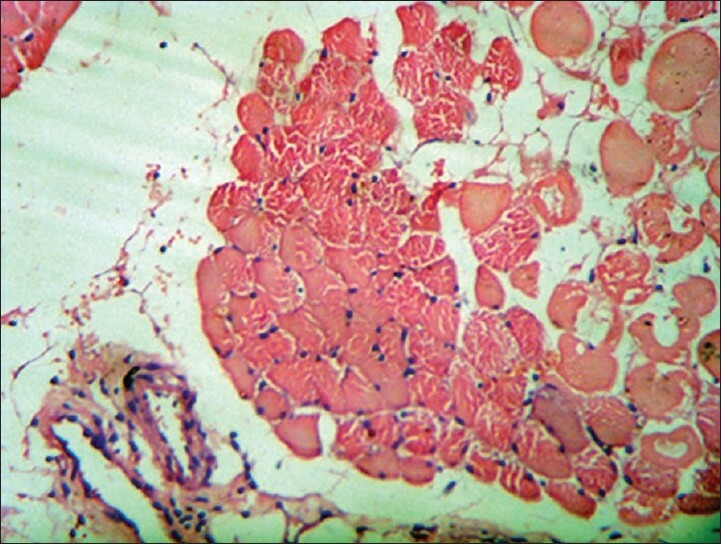 In addition, vessels also showed fibrinoid necrosis and vascular endothelial proliferation. Immunohistochemistry demonstrated beta-amyloid peptide in all three cases-the protein most commonly involved in sporadic CAA. Senile plaques with amyloid cores were present in all areas, whereas neurofibrillary tangles were restricted to the medial temporal region in the autopsied case. CAA is an important cause for intracerebral bleed and may be a contributory factor even when other risk factors for ICH are present. Areas of hemorrhage tend to correlate with severity of CAA changes.